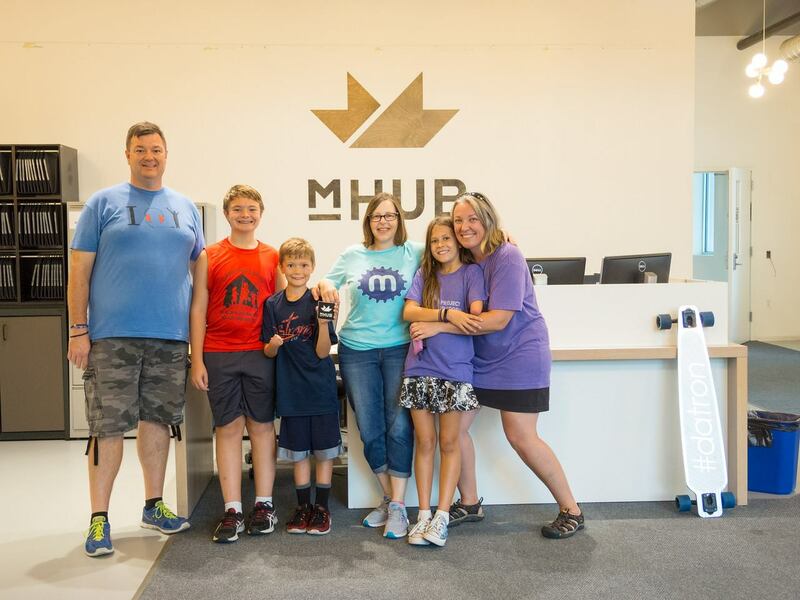 We got to learn about some of the cool creations that have happened inside the mHUB facility. Jordan and I found a way to pack in 46 hours of travel and adventure to visit Chicago and launch a new round of prosthetics. For the first time, Jordan grew out of her arms in less than a year. She’s so much bigger than a year ago. Thanks to that new growth, we had a new chance to hold a meetup in Chicago! With the help of The Maker Mom, Kim Moldofsky, we had a chance to see old and new friends AND tour an amazing maker space called mHUB Chicago. The goal of our meetup was to have a chance to share how Jordan became a maker and 3D designer. She wanted to show how empowering it can be to learn how to create for yourself. Along with a group of kids and parents, we also had a group of college students studying to become engineers. 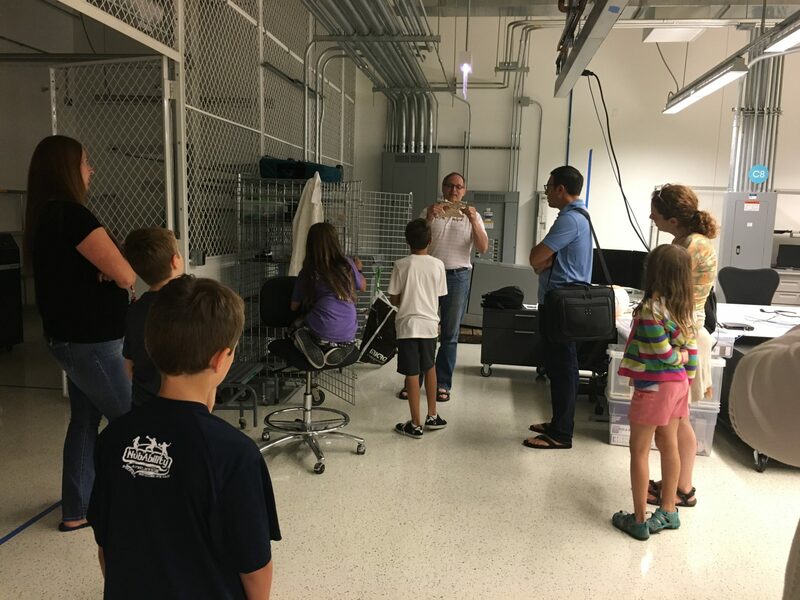 Jordan’s prosthetist, David Rotter, had a chance to attend and learn more about the facility while sharing some of his insights on prosthetics and 3D design. Add in a couple of members of mHUB and we had a show and tell to remember! Jordan and I had to get up at 3am that morning to get into the city to enjoy all of our activities, so Jordan was a combination of exhausted and over-excited. When it came to presenting Project Unicorn, she was a little quieter presenting her experience than in the past. But she still had a chance to shoot her glitter and make everyone smile. In the end, that’s really her goal! I really appreciate Kim and the folks at mHUB for hosting us. It was amazing to see the huge facility and think about all the different ways we can all learn to create. I can’t wait for us to continue finding more ways for kids to learn about this exciting world! Fundamentally, if one treats a kid as a cripple, they will end up a cripple. Treat the kid as someone with a unique hobby, and they will end up as someone with a unique hobby. Kids need to figure out how to navigate // deal with the world for themselves – with benign neglect from the parents. You know – the way *any* kid should be treated. I do not like the euphemism “limb differences”. Shucks – everybody is different. I have one hand and a stub. World: deal with it. I also don’t use a prosthetic, although I had a few as a kid – I ended up hating them because they were awkward and dangerous and useless. They handicapped me. Please do not think I am knocking Jordan. I *love* the glitter horn! But I *do* object to adults that think kids without two hands “need” two hands. I am unimpressed with eNable and similar groups. These 3d printed “hands” are really weak grippers that are trashed when you hit them with a hammer. And: they *fail* if you think they will help the kids “pass” as two-handed. In fact, it is *one more* reason for idiot kids to bully the kid. Fundamentally, they are using their own fear of loss of a limb to try to force the kid into their image of “normal”. My folks let me choose if I wanted a prosthetic. I had three. The last time I wore it was in 5th grade – I got in a fight. When my father got the call, it was not because of who started the fight (the other kid), it was because I hit him with my prosthetic. My dad’s response? “What did you expect him to use?” I gave it up. Not only did it handicap me, it was also *dangerous*. What they/we need is specific tools for specific purposes. Jordan has a tool for a specific purpose: to have fun! I built a tool for the things that require two hands: hammer and chisel or punch. See https://www.instructables.com/id/Fuzzy-Stump-Socket-Prosthetic/ My dad made a plate I could screw onto the prosthetic (instead of the hook) to hold a bow. It was a tool – he was also an engineer. And my fuzzy stump tool? I can make one for $25. You can beat it with a hammer. It is custom to the user. It takes simple tools and materials to make. The 3d-printed “hands? high-end tools, fragile, and available to only those with accesses to resources – the 3d printer, design tools, electricity, good shelter. Mine can be made on the side of the road. You only need electricity if you want to use hot glue. Otherwise, a good glue will work. I will say: prosthetic makers have *fantastic tools and techniques*. I would like them to be in most makerspaces because they can be used for making a lot of really cool things. In my experience, many people who want to “help the poor crippled chilns” really fear losing a limb and thing they will be useless without two hands. This is, of course, self-fulfilling . Please don’t wimp out and not post my comment just because my experiences are different. And – I grew up in the 60’s and 70’s (I was born in 1957) when the world was not as “sensitive”.. Please don’t worry about your comments not posting. Your first post arrived right before bedtime. We’ve had a lot going on so we aren’t jumping on everything at our regular pace. I’m so thankful you took the time to share your thoughts. As I mentioned in an email I sent you, Thank you so much for your note, I think we have a lot of the same perspectives. We are not one of those orgs building “solutions” for people. Instead, we are helping kids learn design thinking and follow job paths like you: an engineer! the kids develop design thinking skills and discover additional job paths. Parents aren’t even allowed in the room while they design so the parents don’t influence their ideas. As for the term “limb difference” I think we can all agree each person has words they use and don’t use. Jordan doesn’t like to use the word “stump” but will use “nub” and “limb difference.” I believe we get to define ourselves the way we want. I will not tell Jordan or any other person the words they identify with. That’s part of each person’s self-discovery.